It has been a very challenging 3-Months in our World. But what was gratifying to take comfort in was a concerted effort throughout the #Outsider properties to work to live up to the Mission to "Transform the conversation about Our World One Notation, One Tweet, One Tweet at a time". This is as a concerted effort was begun to create a Social Good component primarily through contributions to the Johnson and Johnson Donate a Good Program which I launched last year and the team has been featuring on the #Outsider Twitter Channel. Although I was a bit shocked at some of the setbacks at Johnson & Johnson in light of the Product Liability lawsuit losses, It does not take away from what they've done with this program which I look forward to supporting and glad to see the team at #Outsiders has embraced. . It is also gratifying that the #outsider mission is expanding to underscore the role of Instagram in the transformation process. The US Presidential Campaign was one of the key focus points. It has been exciting to be witness to it in spite of the rather unfortuante discourse at times. It was also a watershed Quarter on the Media Front. Al Jazeera retrenched by shutting down its' Americas' Network after having bought it for 500 Million Dollars from Al Gore to be more focused digitally and as it decided that it was going to lay off 500 People from its' headquarters. The Independent of London went all digital and others throughout the World continued to reassess their operations. It was also disappointing to be witness to corruption in Malaysia and South Africa--two countries that I had held out a lot of hope for. #Outsiders will be "dark" for Quarter End though as we gear up for the new Quarter and work away o the long-awaited transition--the "SandBox" has been in what we deem "Public Alpha"--which is admittedly challenging. But, I wanted to end these brief thoughts with once again on a high note as I feature two beautiful images courtesy of the Speaker of The House' Office as he welcomed the Boy Scouts (a cause near and dear to my heart) and he had a touching scene with his Children in his Office as I continue to support the work of #outsiders with the possibilities at hand--and continuing to be hopeful as the Nuclear Security Summit was going on in Washington. I released my wish on the success of the Summit (the final one by President Obama) earlier on my Personal Twitter Feed. 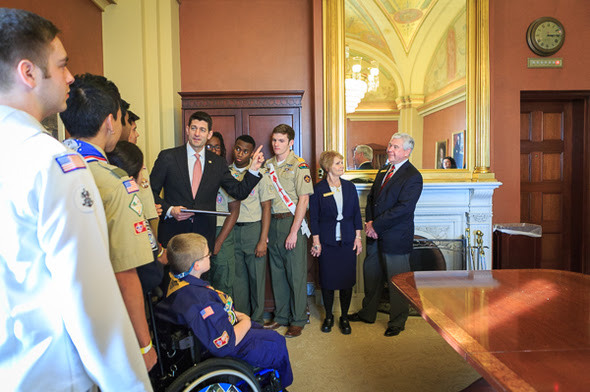 Every year, the Boy Scouts of America present the speaker of the House with their Report to the Nation. And this year, they came with a question too: "What's up with the lights on the clocks around the U.S. Capitol?" Click here to find out Speaker Ryan's answer. 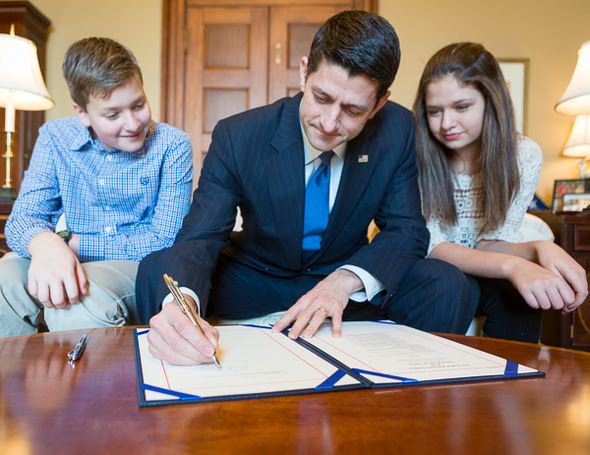 It's not every day that you get to sign your own bill to send to the president's desk to become law, but that's exactly what Speaker Ryan did when he signed this anti-poverty legislation with his two oldestchildren by his sides.